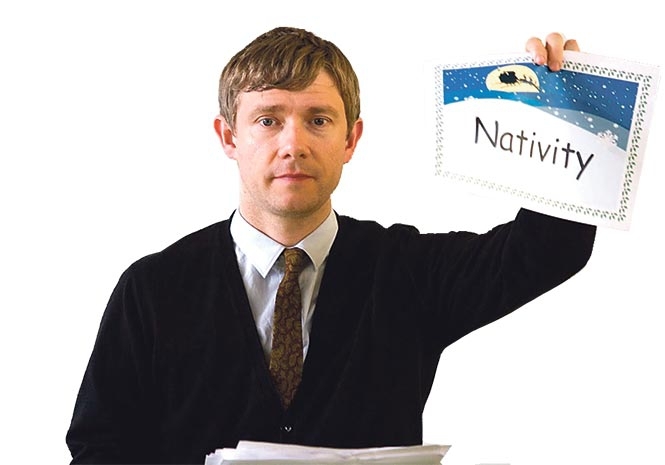 COMPULSORY: Martin Freeman in Nativity! MURDERS, thefts, assault, drug overdoses, lying, fraud and much more are all served up in the most popular soap operas nowadays. 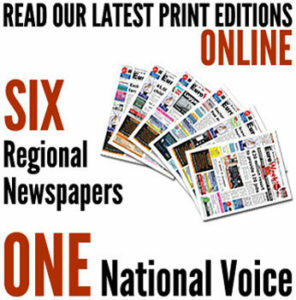 Coronation Street, EastEnders and Emmerdale are very dangerous places to live at present. I realise the script writers are competing for ratings but come on guys, get real. These repeated hospital scenes being shown, really are beginning to grate with the British public. I also think the writers are missing a trick, let’s have some groundbreaking rating busters. How about a plague of locusts, or Noah’s Ark anchored in Albert Square? Being a policeman on any of these soaps virtually guarantees employment. A yearly compulsory watch over Christmas for us is Nativity! ; a children’s film on BBC about a primary school teacher Mr Madden (Martin Freeman) tasked with putting on the school Nativity with the headmistress’s loony nephew, a classroom assistant called Mr Poppy wonderfully played by Marc Wooton. It’s a hilarious and touching comedy come musical that plays with the heart strings, and watch out for cameos from Ricky Tomlinson and Alan Carr. Pointless, the BBC’s nightly quiz show presented by Alexandra Armstrong but overseen and directed by the irrepressible Richard Osman seems to be still going strong after what feels like a million shows. The two presenters’ professionalism keeps the programme fresh, unlike many that went before. I particularly like the celebrity editions, usually shown over the holidays, in which the standard of celeb brain power is put under scrutiny. It’s amazing where these celebs come from, one or two I must confess I thought were deceased. Some stars should clearly change their agent. Storage Hunters on Dave TV is a rip off from the American series of the same name. It features a motley crew of punters bidding for the contents of storage containers presumably left by their owners. The original American version is slick, smart and full of brilliant one liners from the punters. The English version is dim, dull and full of false people buying garbage. Against my better judgement but in the line of duty I watched Doctors Behind Closed Doors on My 5 and found myself enjoying it to the degree of taking in a few more episodes which were running continuously. There’s something quite bizarre about being in a doctor’s treatment room ‘spying’ on seemingly unsuspecting patients. It’s really interesting to see what the diagnosis is and what treatment is prescribed, but also very scary at times. Different doctors featured with different patients and my conclusion was what a great job they do. McMafia is both stunning and confusing but highly watchable. Maybe my brain’s incapable of absorbing this fast moving plot. It’s an everyday tale of a Russian oligarch (!) and his family, conflicting with the shadowy criminal past activities of the ageing father. Violence and huge finance abound as Alex Goodman (James Norton), son of the tortured father tries to unravel the exact cause of his father’s grief. The quality of the filming is stunning and it’s a class watch.